The Purchasing department is only informed about such requests after approval has been granted. A business process can require manager approval when, for example, certain thresholds are exceeded, such as Total Net value, or when an employee sends a request for Shopping Cart and so on. When the business process requires manager approval, the system accesses the organizational structure and searches for the manager responsible. For example:If the business process needs to identify a cost center manager for a shopping cart that has been created in the system, the system identifies the Requestor and search for the responsible cost center manager. The shopping cart then appears for approval in the Manager’s worklist. Direct Approvers:The Direct Approvers rule enables you to send an approval task to an employee or employees directly as mentioned in the Approval Process Definition. Document is submitted for approval and Person Responsible gets the business task in his Approvals view. If two approvers are assigned in the Direct Approvers list, system sends task to two users at a time. If any one of them approves, the task gets completed. In case , if the requestor, creator, or recipient is assigned as the direct approver, and if the approval process consists only of a single step involving the same person as the direct approver, then system will skip the approval and the document will be requested. Example: In this case, Manager is creating document and he himself is the Direct Approver. When user submits the document for approval, system determines him/her as a Manager, however no task will be created and document will be submitted and Requested. This rule enables you to determine an approver based on the cost assignment. Based on the account assignment, the document is either sent to the cost center manager, or the project manager for approval. For purchase orders, the document can also be sent to the reporting line manager if it contains stock materials(to-stock Purchase orders) or inventory items. 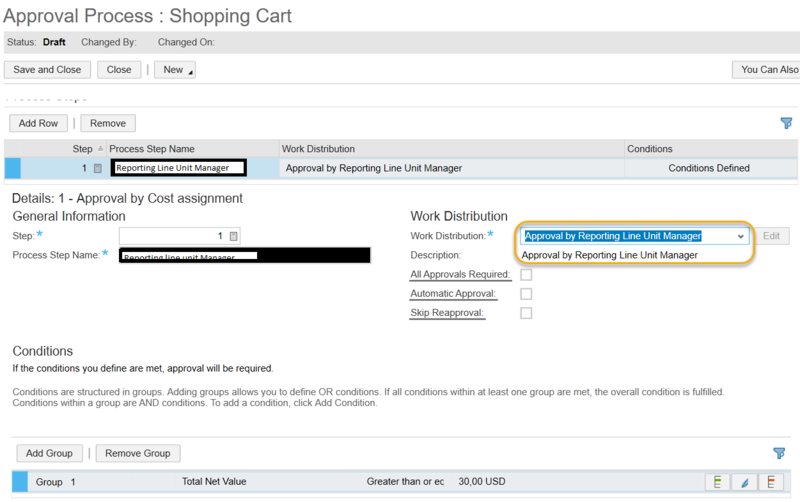 For multiple items in Purchase order, system will send task to managers of all the cost assignments. If Shopping Cart or Purchase Order is assigned to Cost center, then cost center manager has to approve the relevant Purchasing document. If Shopping Cart or Purchase Order is assigned to Project Task, then Project Manager has to approve the relevant Purchasing document. The Approval by Reporting Line Unit Manager enables you to send an approval task to the reporting line unit manager of the Requestor / Buyer responsible. 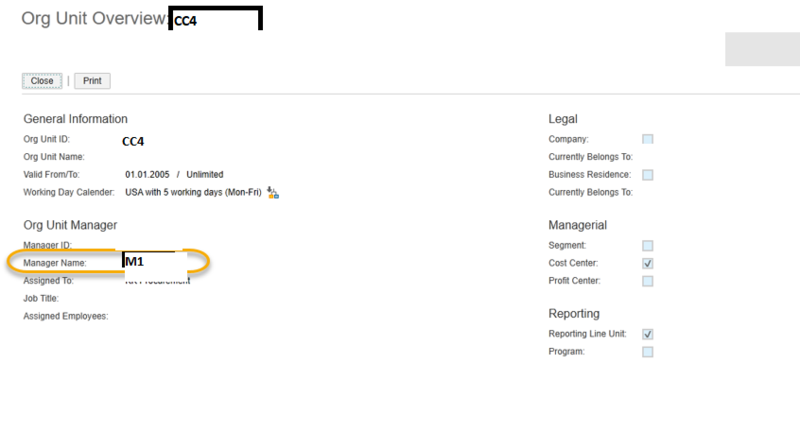 System determines Reporting Line Unit Manager of the Requestor or the Buyer Responsible as an approver. 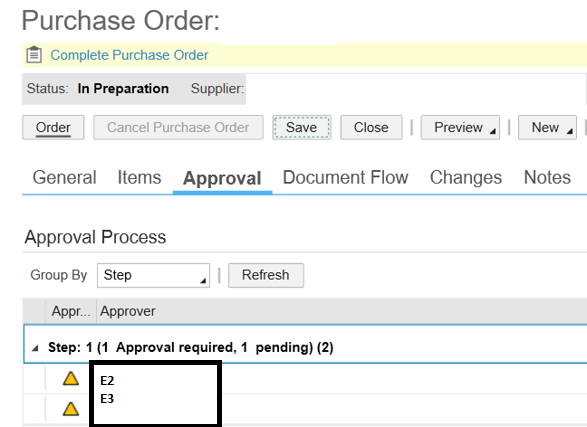 If the Automatic Approval checkbox is selected, no approval task is created and the purchasing document will be processed. If the Automatic Approval checkbox is not selected, then an Unassigned Task is created. 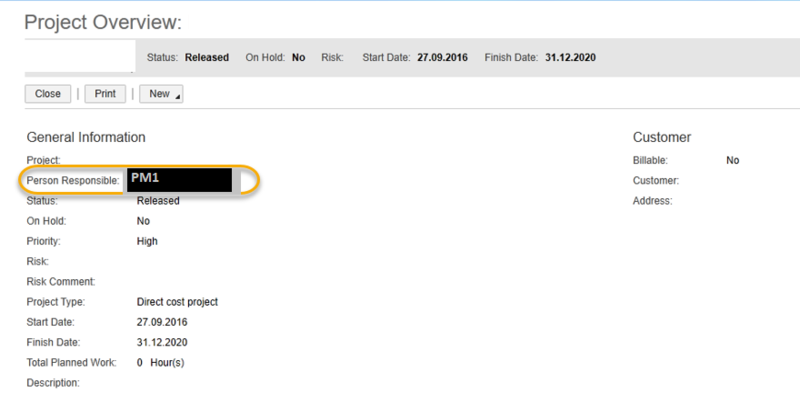 The Approval by Next Level Reporting Line Unit Manager enables you to send an approval task to the Manager of the Reporting Line Unit Manager of the Requestor / Buyer Responsible. 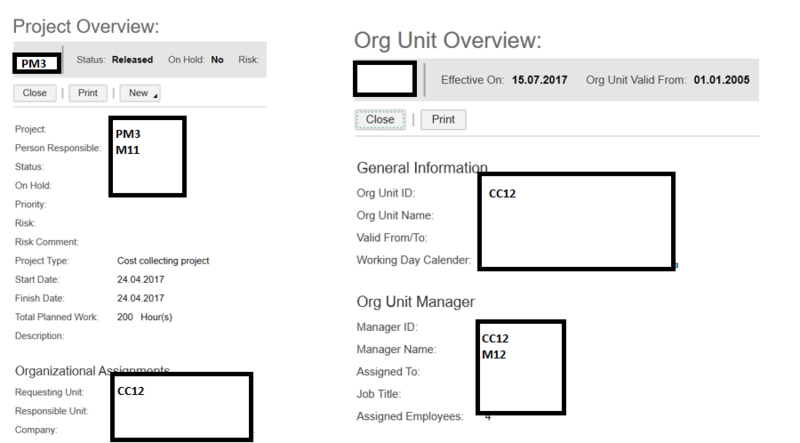 The system first determines the line unit manager of the Requestor / Buyer Responsible and then sends an approval task to the manager of the reporting line unit manager. The reporting line unit manager of the Requestor / Buyer Responsible is the approver, if their approval limit defined in the employee work distribution rule matches. If it exceeds the value limit, system determines higher level managers from Org Structure, based on the Approval Value Limit. Maintain the Employee Work Distribution Rules based on Org Structure hierarchy to determine the correct Approver. This rules works in the same way as Approval by Reporting Line Unit Manager by Value Limit. Except that, task will go to all the approvers in the Org hierarchy, until it finds the manager with the specific approval Value Limit. If Advanced Approval Limit is not scoped, system will follow the default rule i.e. Employee Work Distribution Rule. This rule enables you to determine an approver based on the approval limit only if the business document is assigned to a project. If the net value of the business document exceeds the approval limit of the approving manager, the system automatically determines the next eligible approver from the cost center hierarchy. If the document is assigned to project, project manager approves if the value is in the limit, else the approval limit of the managers of the cost center hierarchy of project task is compared. If the document is assigned to cost center, cost center manager approves if the value is in the limit, else the approval limit of higher level cost center managers is compared. 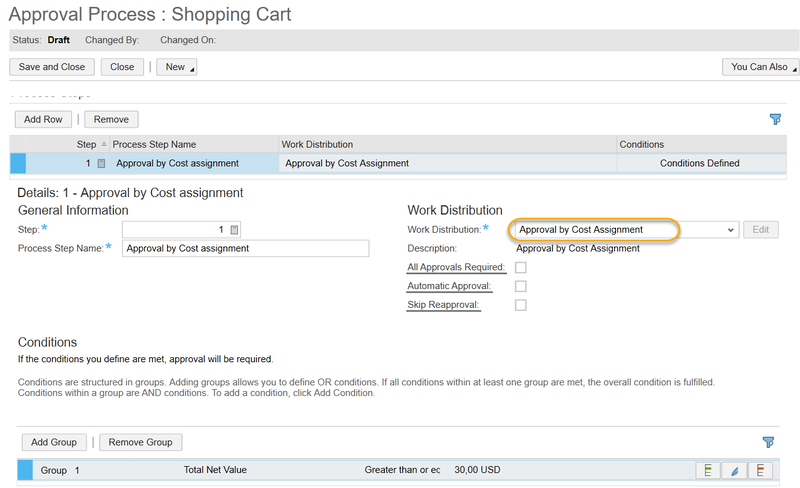 Cost center manager approves if the approval limit matches or exceeds the shopping cart value. If the limit for the cost center manager is exceeded, higher level cost center manager approval limit is compared. Cost center manager approves if the approval limit matches purchasing document value limit. If the limit for the cost center manager is exceeded, higher level cost center manager approval limit is compared. Approval task is triggered for all the cost center Managers up to the value limit. This is applicable specifically for Purchase Orders. The reporting line unit managers of the employees who received the products is the approvers if their approval limits defined in employee work distribution match or exceed the purchase order value. Otherwise, higher level managers are determined until their approval limit matches or exceeds the purchase order value. 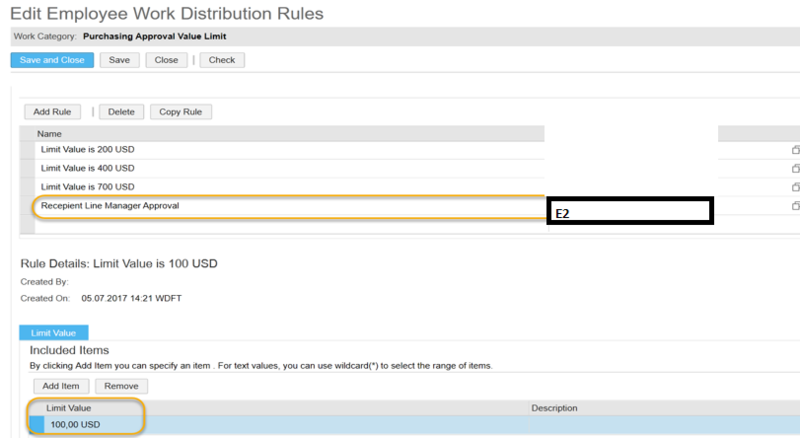 If you do not maintain the purchasing value limit in the Employee Work Distribution rule, system will determine all the line unit managers of the recipient. In case, if the value limit exceeds, then system will determine all the line unit managers of the recipient.